Title of Presentation - Who are the Celts? So what will you be addressing? This is a controversial topic, since it has become fashionable to deny that anyone in Britain or Ireland was ever a Celt. Indeed the extreme version of Celtoscepticism aims to blot the Celts from history altogether. In essense this is an argument about ethnonyms employed in Classical sources. I aim to show that these need a more sophisticated interpretation, and to be combined with evidence from archaeology, population genetics and linguistics. Such a multi-disciplinary approach can shed light on the development and migrations of the peoples that I am happy to call Celts. What is a building historian doing delving into the days before buildings or history? Incurable curiosity is my only excuse. Though I have been interested in the human journey all my life, there has been little time to pursue this passion into the far past. Over the last quarter-century I have been too busy researching buildings and settlements from Saxon to modern, resulting in many reports and publications. Happily a convalescence coincided with an exciting time for lovers of prehistory, which I would have been sorry to miss. The winds of change are blowing through our vistas of the past. One source is the whirlwind of activity by population geneticists. New studies appear constantly. Most enlightening are those pushing hard at the boundaries of the possible in retrieving DNA from ancient bones and teeth. Meanwhile a paradigm change is spreading through archaeology. The idea of migration in prehistory, so long out of favour, has come bouncing back. Since it helps me to distill what I have learned if I pull it into a narrative, a collection of articles found themselves being written on the fly and posted onto my website. The advantage of putting material online is that others can comment on it. Then it can easily be revised and updated. All my writing specifically for the Internet is aimed at the general reader. Yet much of this material is so new that it demands references. The end result was a strange hybrid of popular and scholarly writing. When readers pressed for a printed version, the hybrid was transferred into book form as Ancestral Journeys (2013), leaving online my collation of ancient DNA results. 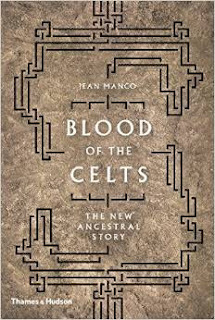 In autumn 2015 Thames & Hudson published a revised reversion of Ancestral Journeys in paperback and a new book Blood of the Celts.